Are you looking for a relaxing small island get away? Let the Rush Inn be your introduction to Thetis Island’s charm, friendly people, quiet countryside, meandering roads, and of course good food! Our home was built in the late 1940’s/early 50’s and we updated the entire structure in 2012. We have two bedrooms that we offer for B&B; one has a queen bed and the other two twin beds. Both rooms are on the lower level of the house with an excellent view of the water. The bathroom for these two rooms is on the main floor, it is modern and spacious. The Rush Inn is located on the west side of Thetis, facing Chemanius, Vancouver Island. We are approx ½ mile south of the ferry dock. We have three acres and are located on the ocean with approx 200 feet of private and peaceful waterfront. You can lounge on the beach, or sprawl on the decks which have very good views of the ocean. We have fruit trees, two vegetables gardens as well as a forested area. The fruit trees and the garden provide us with ingredients for home made jam, jam squares, pies and other delectable dishes. Keith and I both love to bake and for breakfast you can enjoy homemade bread, scones, fresh fruit, muffins, island fresh eggs, organic yogurt. Basically if there is something ripe in our garden, we will offer it. Are you looking for accommodation on Thetis Island while you attend a wedding at Overbury Farm Resort? We are located approximately 5 minutes from the resort. 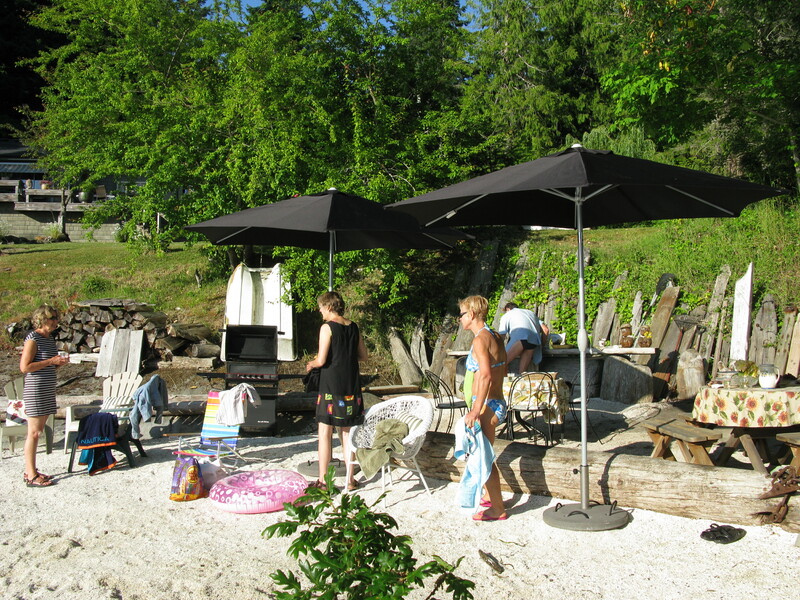 Our B&B is located on Thetis Island in British Columbia, Canada. Thetis Island is close to Vancouver Island and north of Salt Spring Island. Thetis Island is approximately 6 miles long, 2 miles wide and has about 400 full time residents. We have regular ferry service provided by BC Ferries which departs from Chemanius on Vancouver Island. Chemanius is approx ½ way between Victoria to the south, and Nanaimo to the north. Both Victoria and Nanaimo are served by BC Ferries from the Greater Vancouver area. We also have float plane service 3 x day provided by Seair Seaplanes from the float plane terminal located on the Fraser River close to the Vancouver International Airport. Float planes arrive at the Thetis Island Marina close to our home. If you have never flown in a seaplane it is FUN! The flight is approximately 20 minutes, a very efficient way to arrive. If you have any questions about the best way to travel to Thetis Island please contact us, we are experienced.